If you thought the "mandatory dishonesty policy" sign seen earlier was a hoot, check out the sign on the right here. Frankly their grammar and typesetting should be criminal. The sign reads, "Caution, includes store employees, shoplifting is a serious crime, a criminal offense. 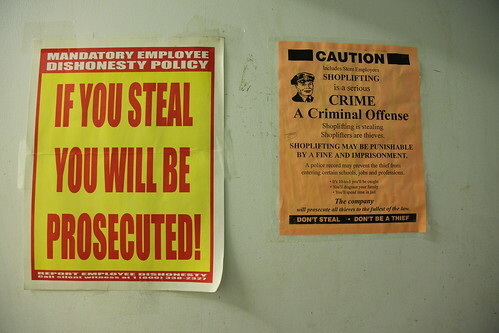 Shoplifting is stealing. Shoplifters are thieves. Shoplifting may be punishable by a fine and imprisonment. A police record may prevent the thief from entering certain schools, jobs, and professions. It's 10-to-1 you'll be caught. You'll disgrace your family. You'll spend time in jail. The company will prosecute all thieves to the fullest of the law (sic). Don't steal. Don't be a thief." I totally would have stolen these!